Dark green is a subtle and versatile tie colour. You’re not surprised I think that, right? After all I sing the praises of green at every opportunity. But broad truths bear repeating. With an outfit like the one above, navy would be the safe choice, the classic choice. Grey might work equally as well. But better would be green: just as subtle, but far more interesting. The club stripe makes it pair easily with an odd jacket (less formal than a dot or any small, repeating pattern) and the shantung silk adds even greater depth. Deep red is also a great club-stripe colour, but it works best with mid-greys, where green goes with navy, grey or (here) tan. Shantung, by the way, is one of the few materials other than knitted or unlined wool that works with denim. This example is from Shibumi. Jackets in the background from Orazio Luciano. Photo, Luke Carby. You can follow the discussion on Green, shantung, club (tie) by entering your email address in the box below. You will then receive an email every time a new comment is added. These will also contain a link to a page where you can stop the alerts, and remove all of your related data from the site. 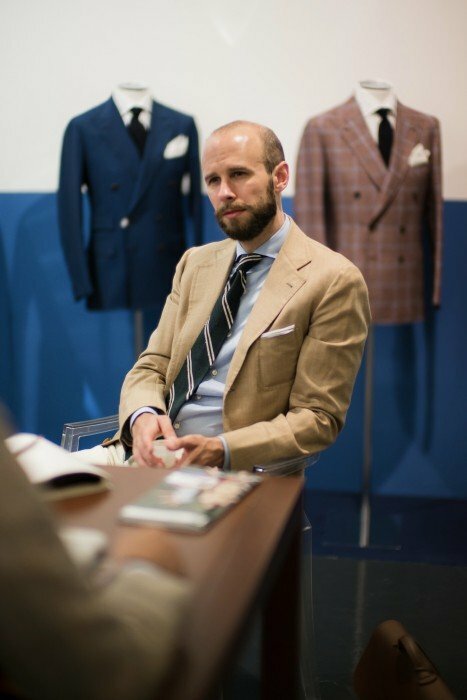 I notice some of the Shibumi ties have a raw worn effect to them, I like this look but worry it will look scruffy quickly – do you have any experience of them? I like your idea of green. I’m considering a tie that is a dark green pin dot(white). What’s your opinion of that design and how would you wear it? Sounds nice. Very versatile if dark, could wear with lots of things. Plain blue shirt and navy suit as a kick off? That ensemble would look very nice indeed. Couldn’t agree with you more on the benefits of green Simon! Please don’t take this as a complaint as I think Luke takes lovely photos, but I often feel like his editing often distorts the colours of your outfits. In this picture, your tie looks more blue than green and, in yesterday’s post, your salt and pepper jacket looked more beige then grey. Obviously there’s always a degree of creative license and the shots are great but I’d love to see your outfits in their true colour, so to speak. Same here. A better colour rendition and pictures of your whole outfit would be great. I’ve certainly taken to bottle green with my navy suits since reading some of your articles. On the subject of colour could you do a piece on skin tone and color? For example what colors to avoid as much as those to wear depending on whether someone is pale, brown or darker skinned. This discussion will be very interesting and helpful,particularly your point concerning exaggeration. Great article as ever Simon. I’m looking at buying a few ties for a basic wardrobe. Would you still recommend a navy stripe as the most useful? Great tie, love the color. I always gravitate toward green tie for some reason. I’m curious about the shirt collar however. The cutaway collar just seems very formal to these American eyes. I don’t believe you’ve written anything about Orazio Luciano. Do they specialise only in Neapolitan-style clothing? That appears to be the spalla camicia on those jackets, no? Yes they do, and it’s great stuff. Look out for Friday’s post! Looking forward to it Simon! A Savile Row question for you…have you any experience with Maurice Sedwell? Simon, I have on a very similar tie as in the picture. I’m wearing it with a white shirt,dark green/black linen slacks, and dupioni black silk three button jacket. The shoes are the Chapel model loafer in black from John Lobb. Thanks again for the reminder about how great looking a dark green tie can be. On a different note: If you ever need information regarding the scene in Buenos Aires, I will be more than happy to get it for you and your readers. I know BA is a bit out of range, but there are some notable manufacturers around here (specially footwear, and some ancient italian tailors). In shirts and ties you are showing a striped tie in dark green. You call the quality shantung, but in my opinion it is a bourette silk. Thank you Hermann. I am no expert on silk weaves, but it is the same style and quality that is universally referred to as shantung – including by all the current retailers I know.